Então não deixes de ganhar estes prémios! 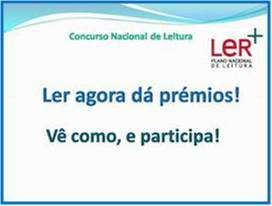 This entry was posted on Sábado, 10 de Novembro, 2007 at 10:04 pm and is filed under Concurso Nacional de Leitura. You can follow any responses to this entry through the RSS 2.0 feed. You can skip to the end and leave a response. Pinging is currently not allowed.